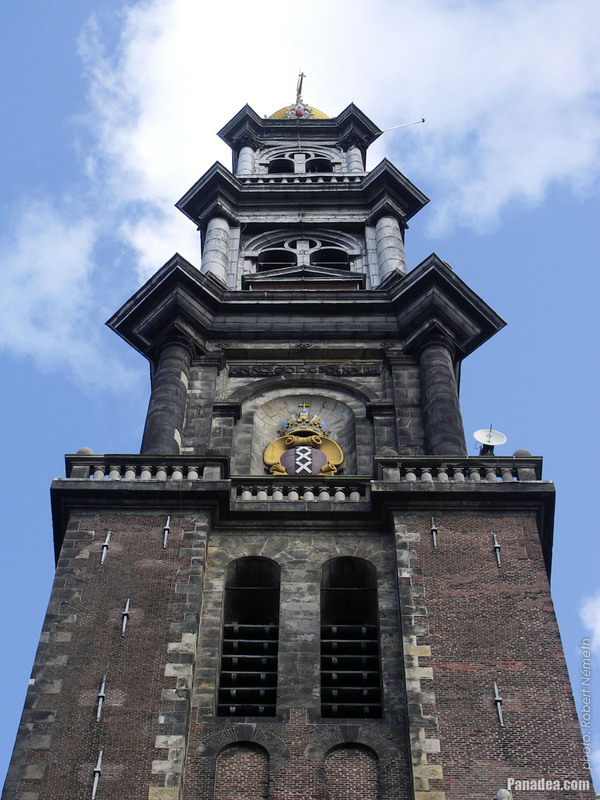 It was built in 1695 and it is supposedly more inclined than the Leaning Tower of Pisa. 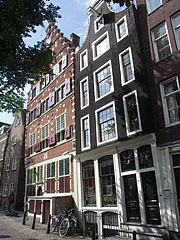 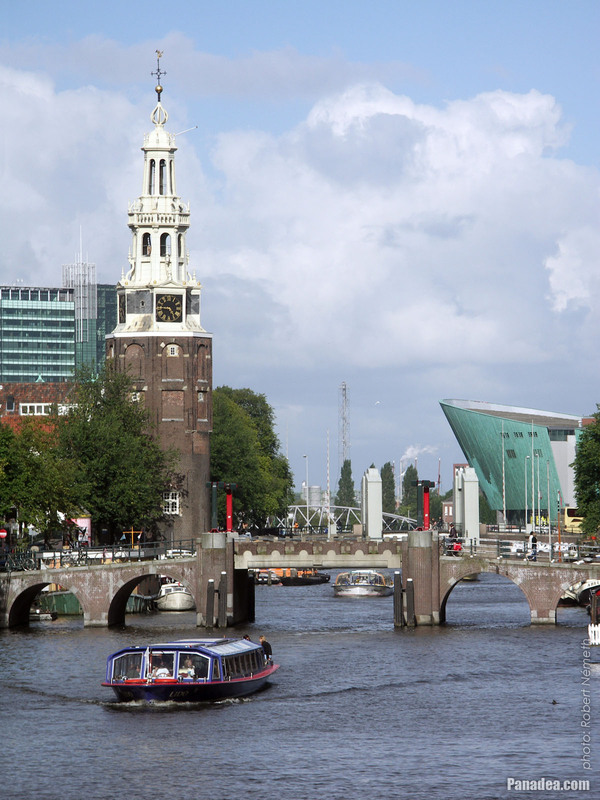 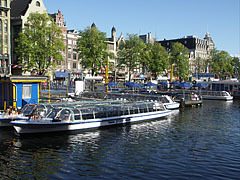 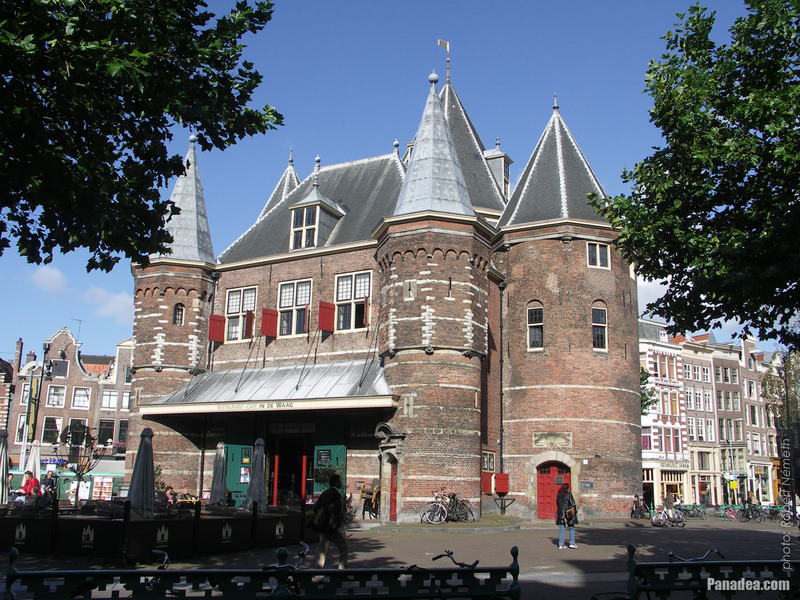 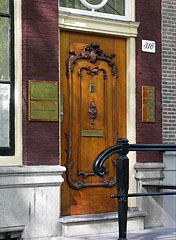 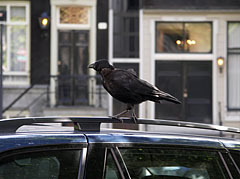 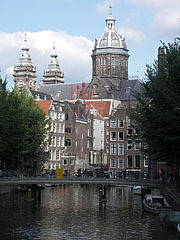 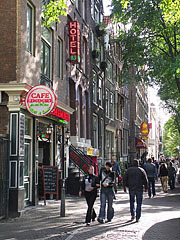 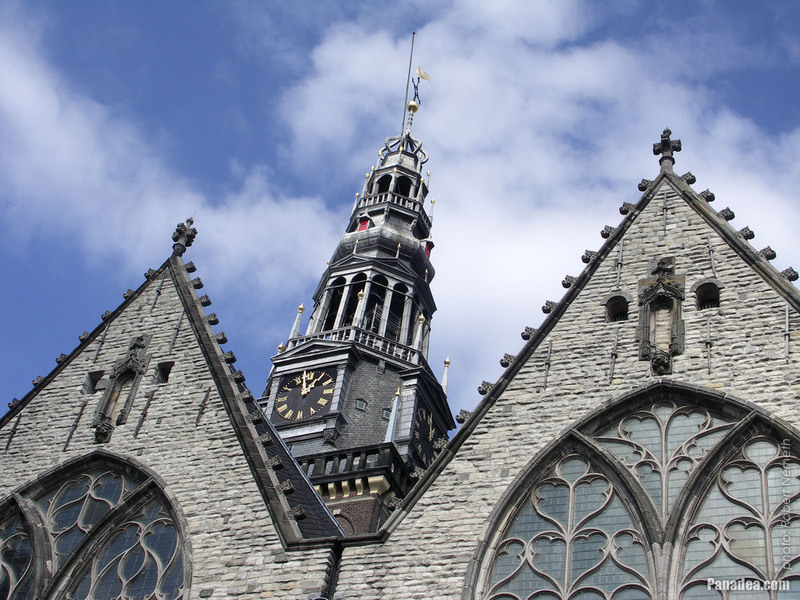 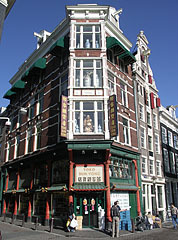 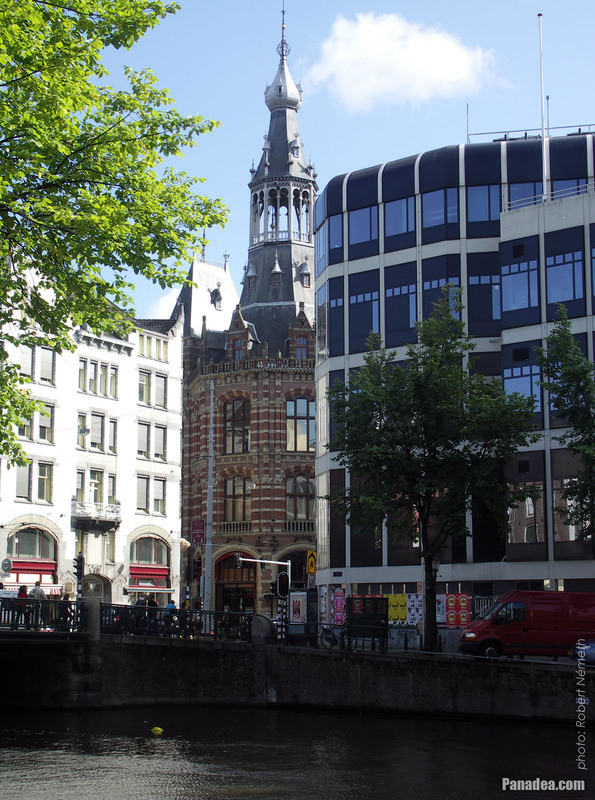 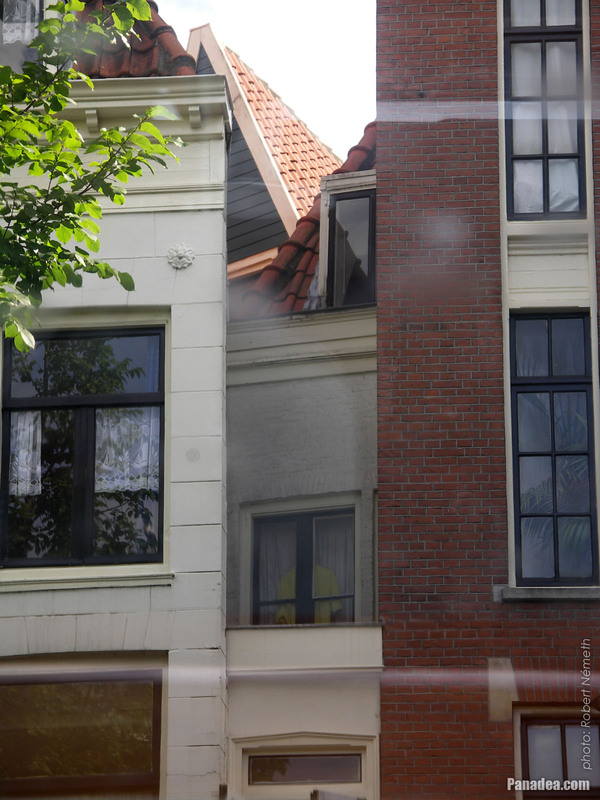 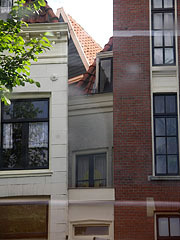 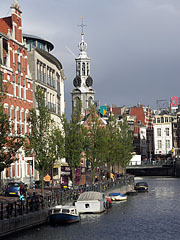 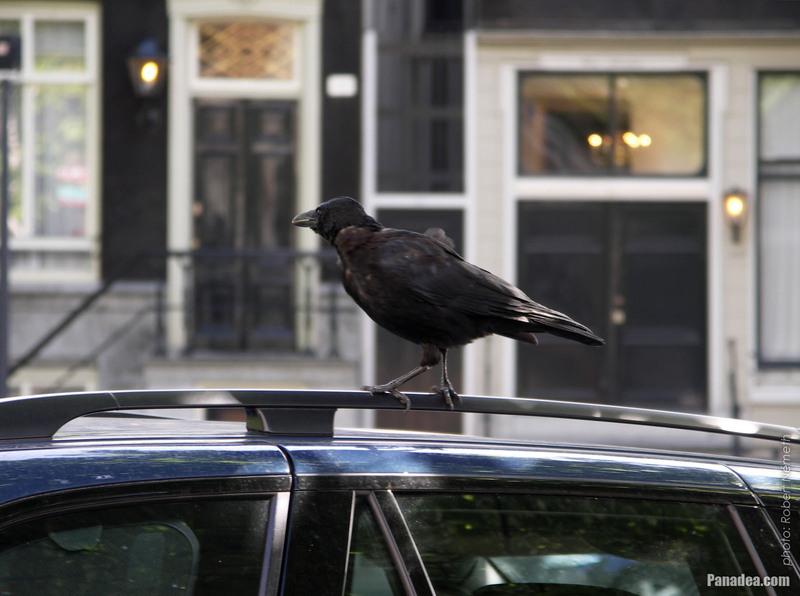 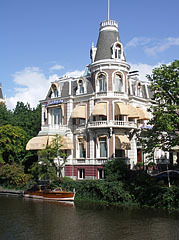 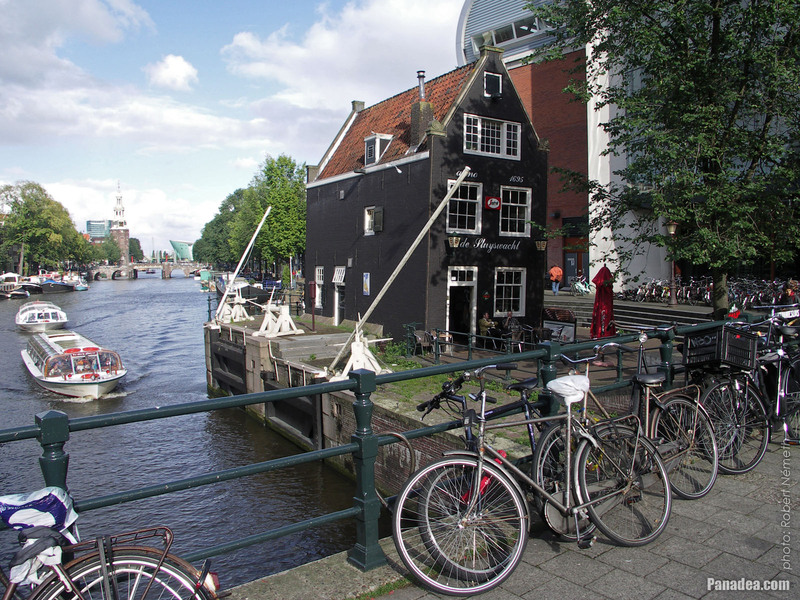 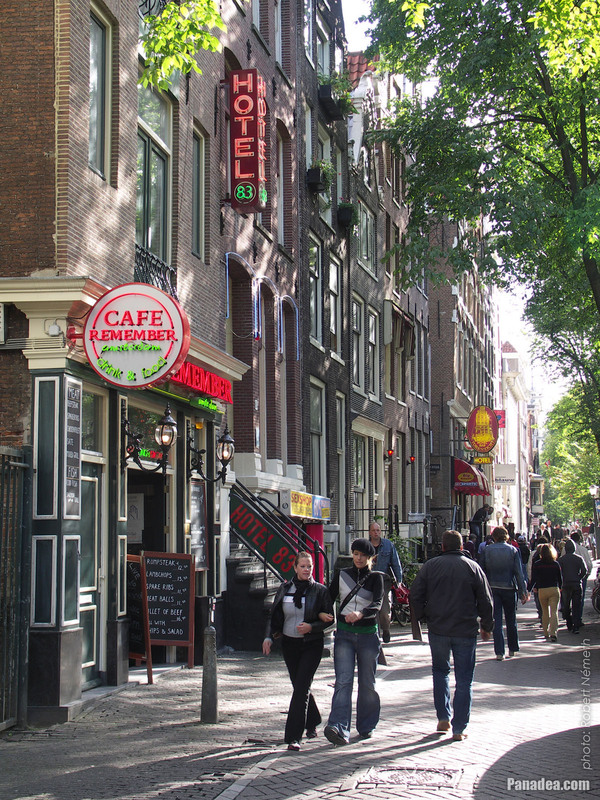 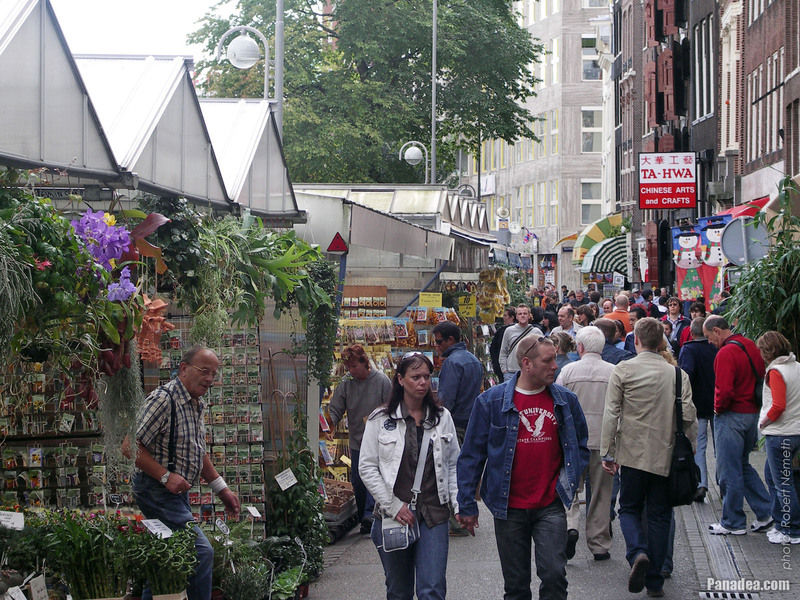 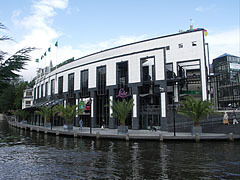 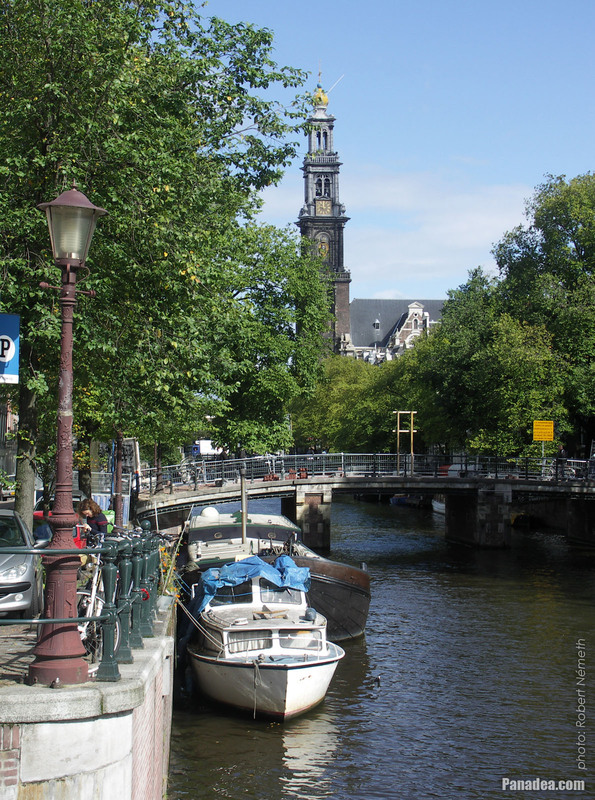 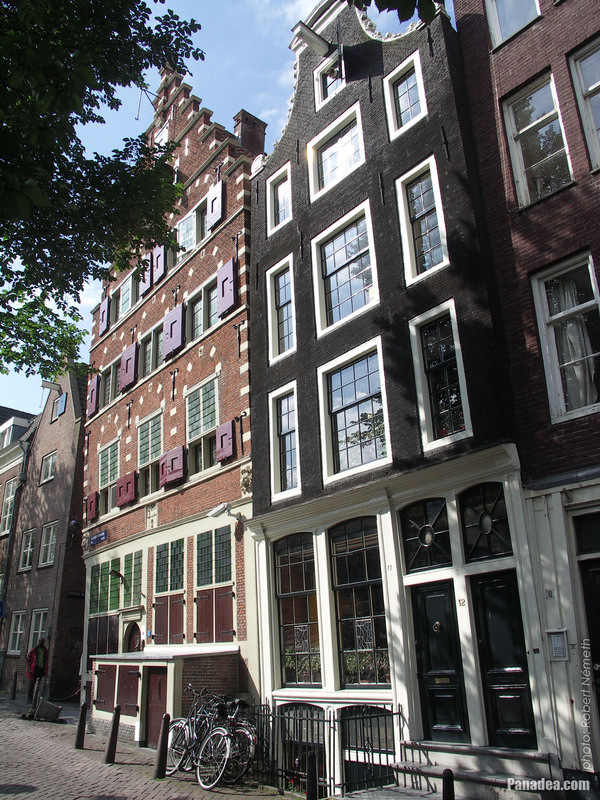 Today there is the In De Waag Restaurant & Café in its ground floor. 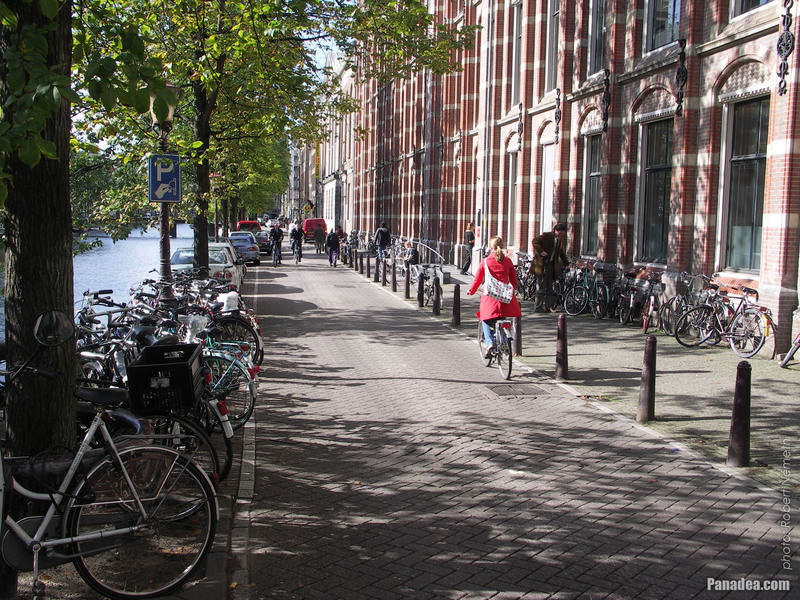 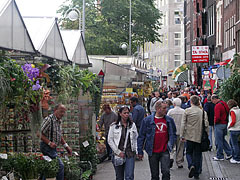 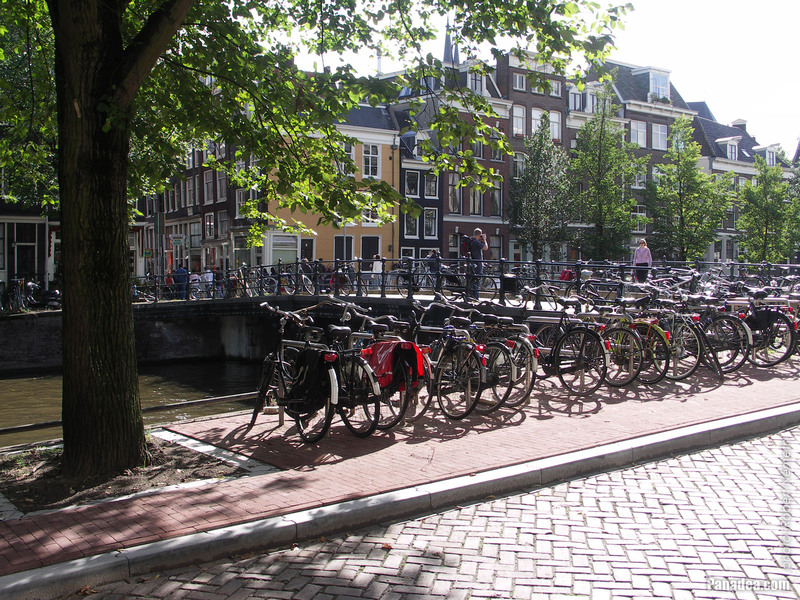 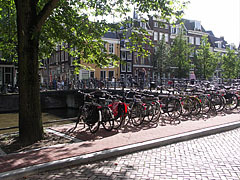 Among other things there is a red-brick building and a lot of bicycles on the photo. 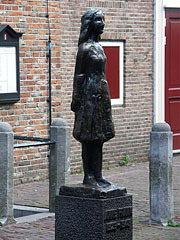 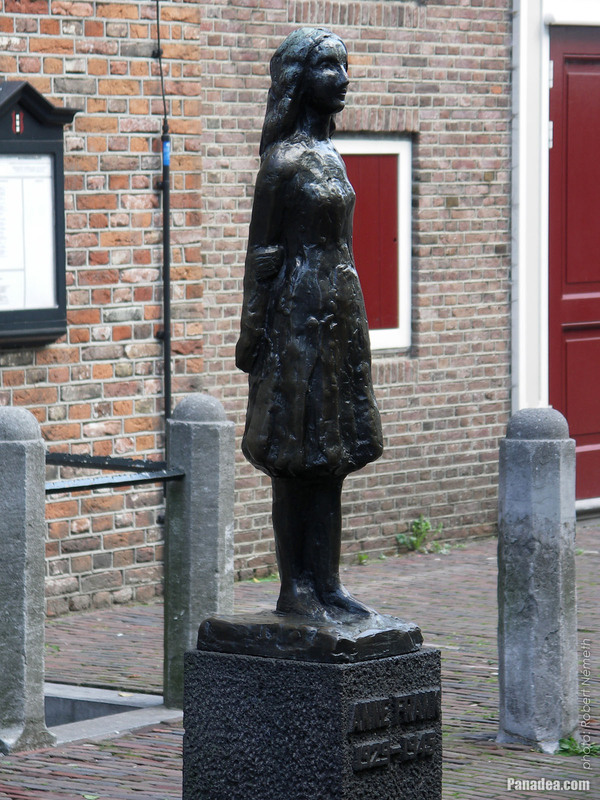 Anne Frank (1929-1945) was Jewish-German girl in the World War II, primarily known for her wartime diary. 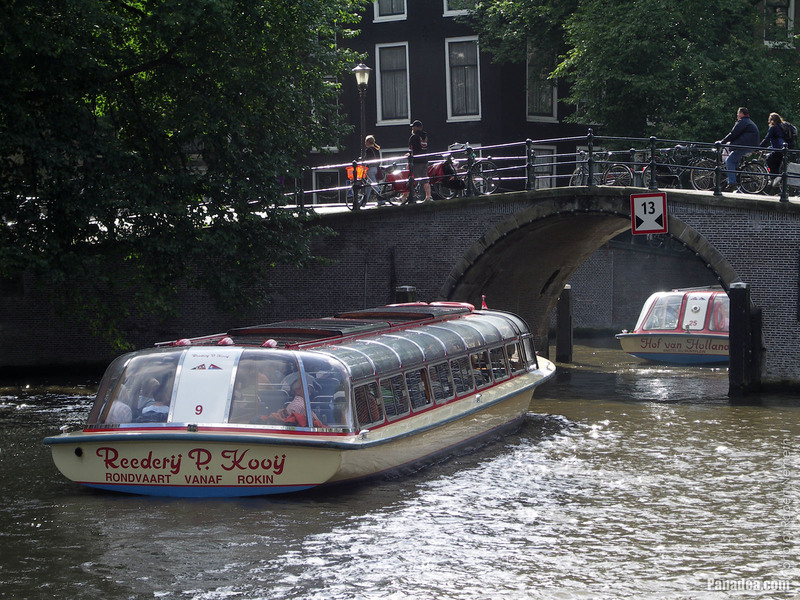 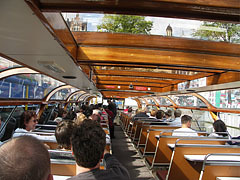 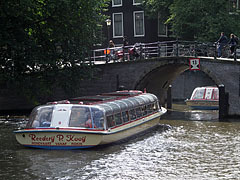 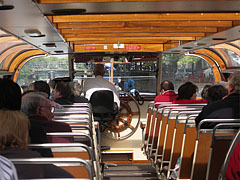 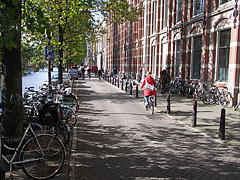 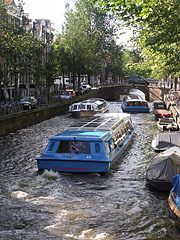 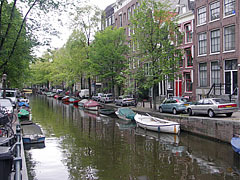 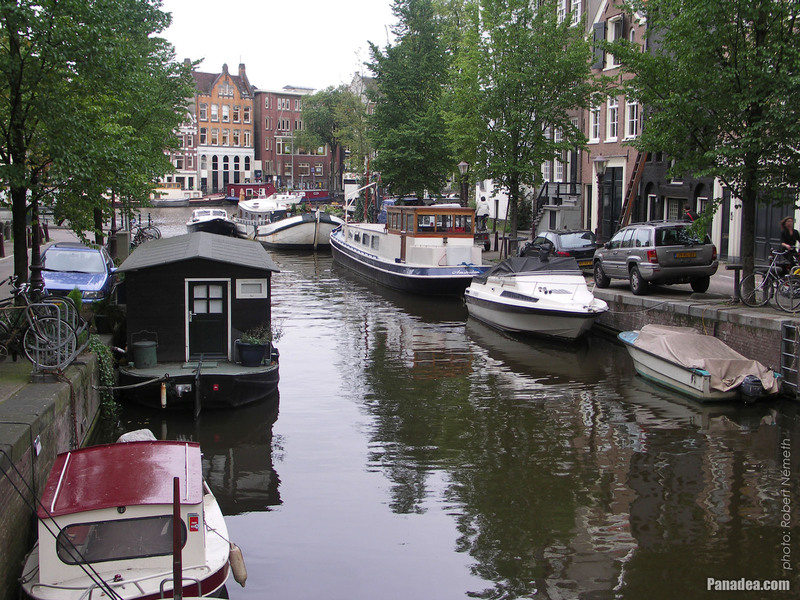 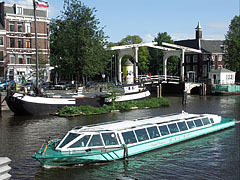 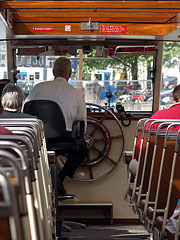 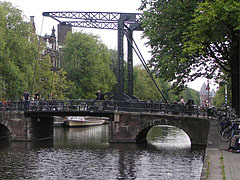 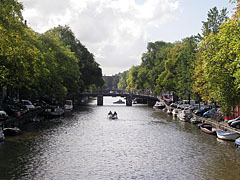 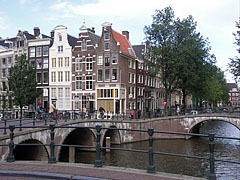 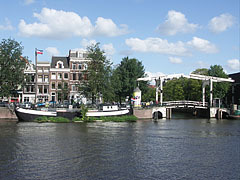 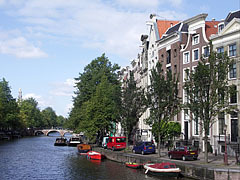 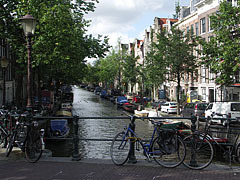 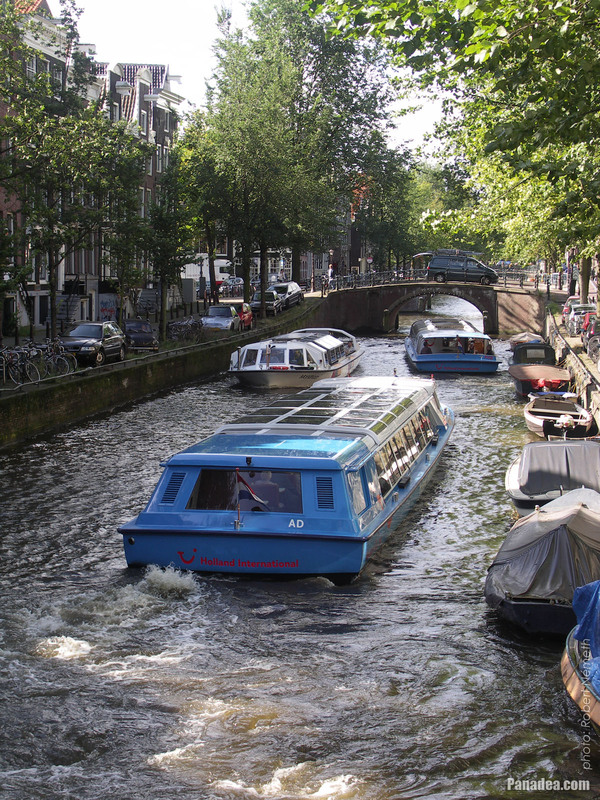 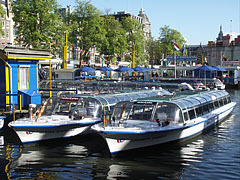 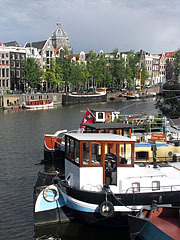 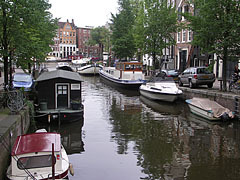 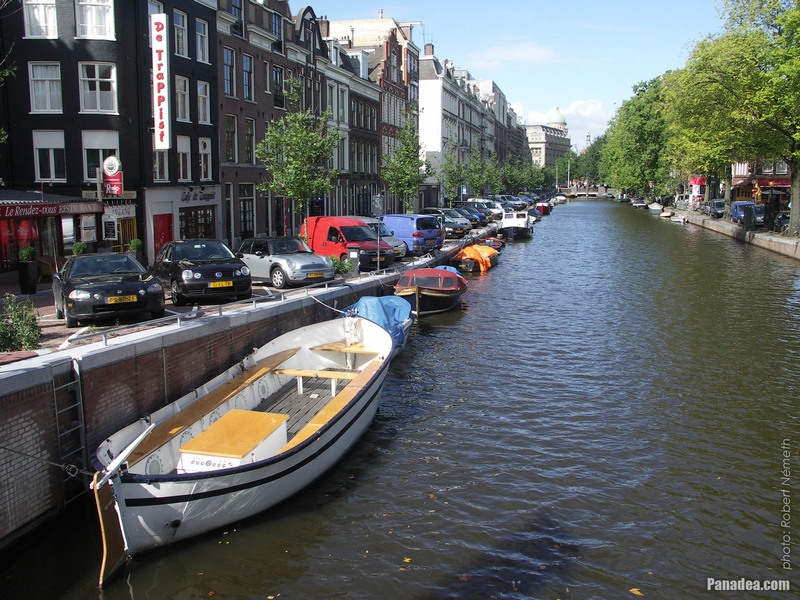 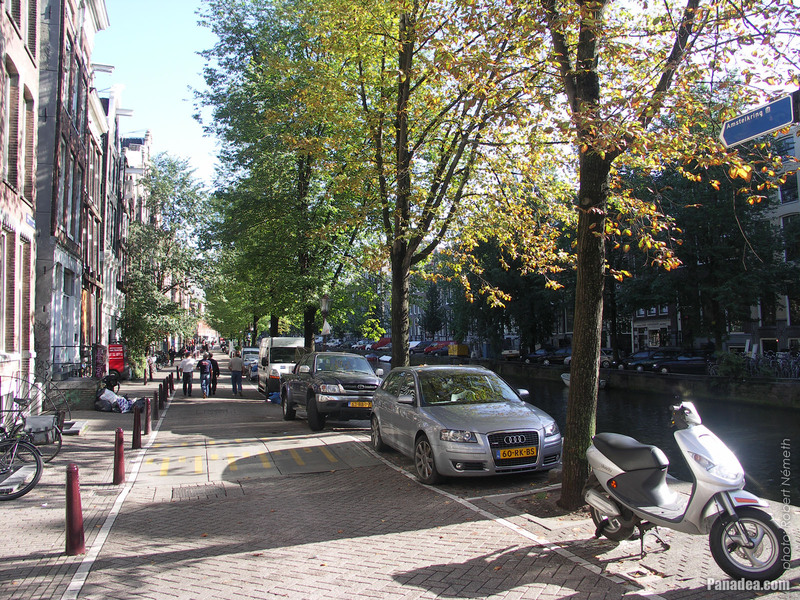 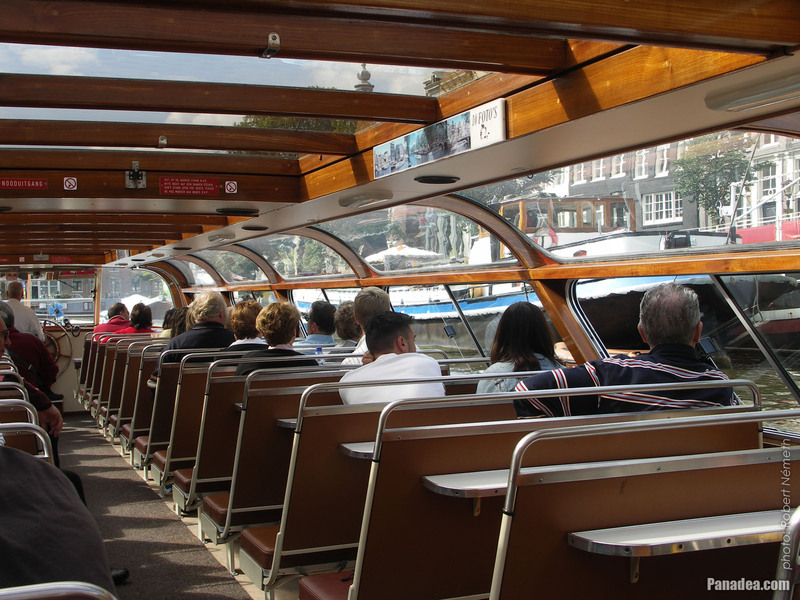 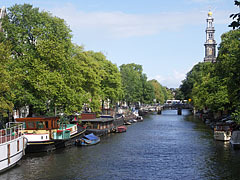 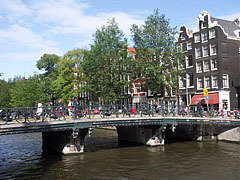 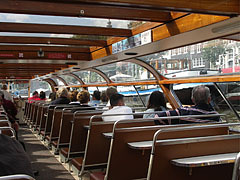 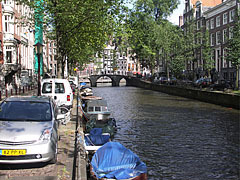 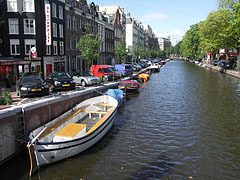 View of a gracht from a small bridge; on the water boats, on the bridge bicycles are "brethed"
At a gracht junction at least three bridges are needed to be able to reach every embankment on foot, exactly like here. 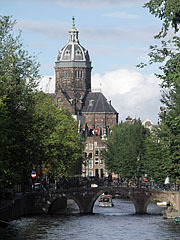 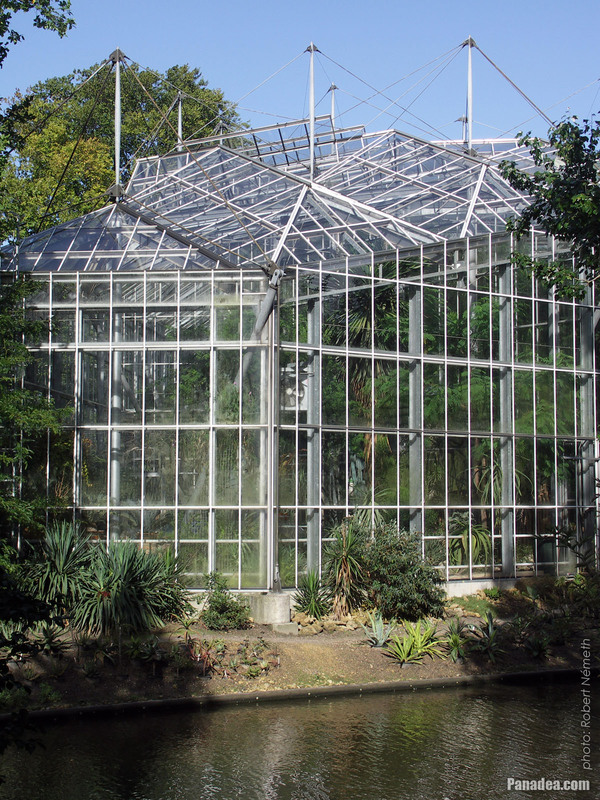 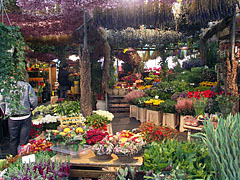 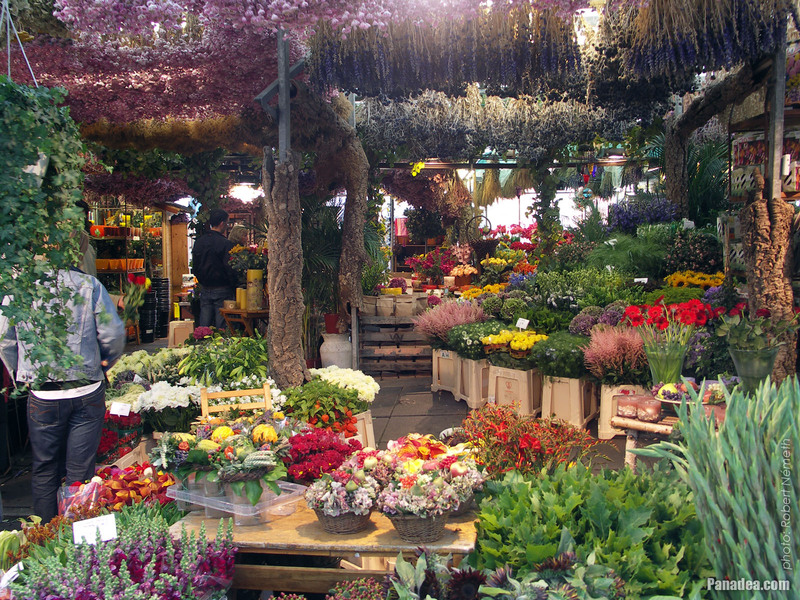 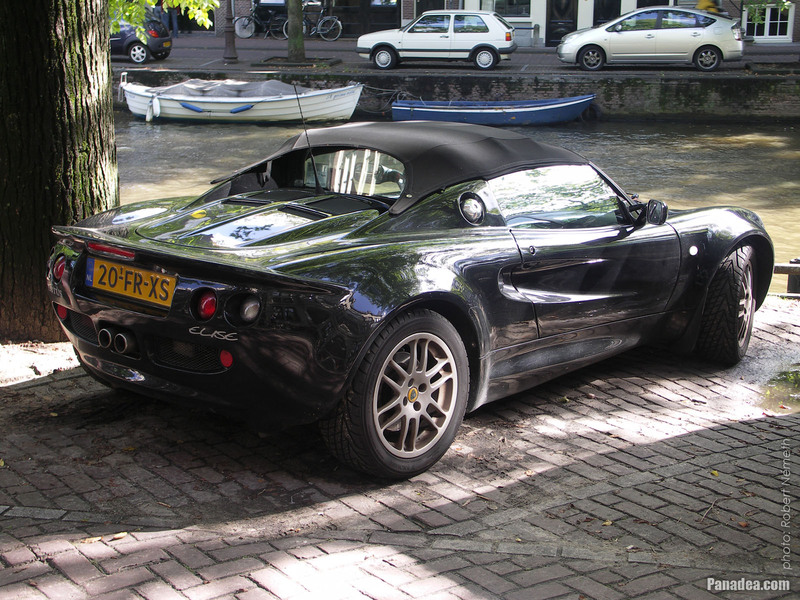 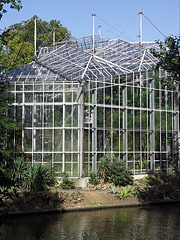 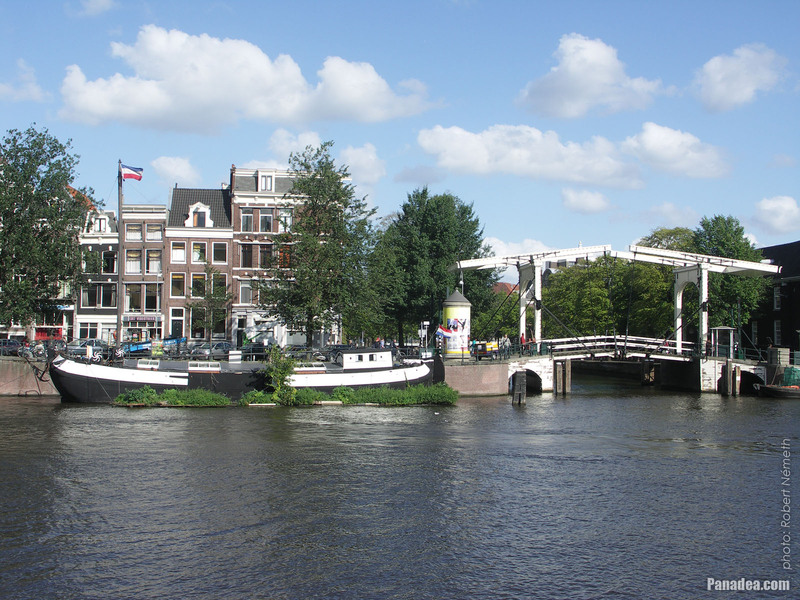 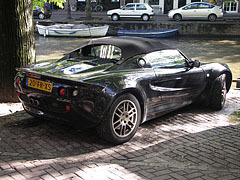 It was built in 1912 in Amsterdam School expressionist style, as well as the garden was established in 1638. 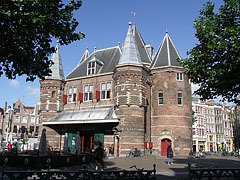 Designed by Alfred Tepe, opened in 1883. 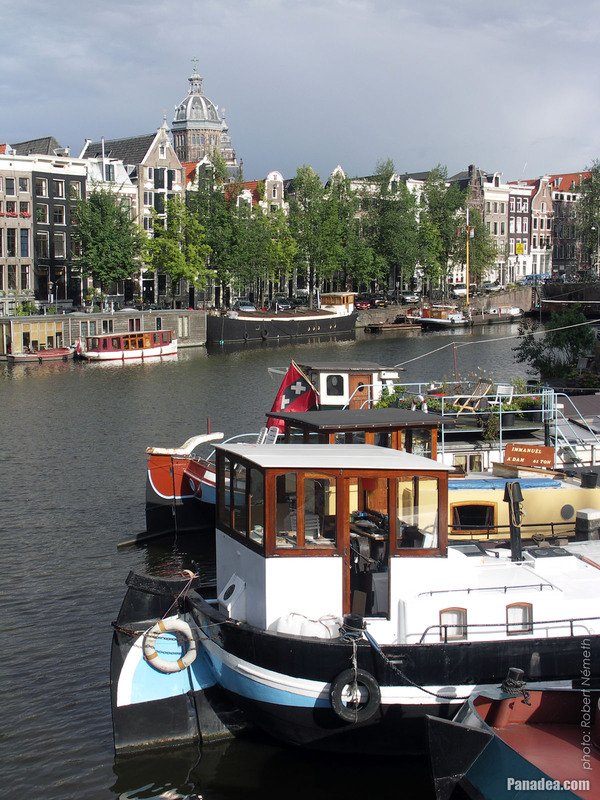 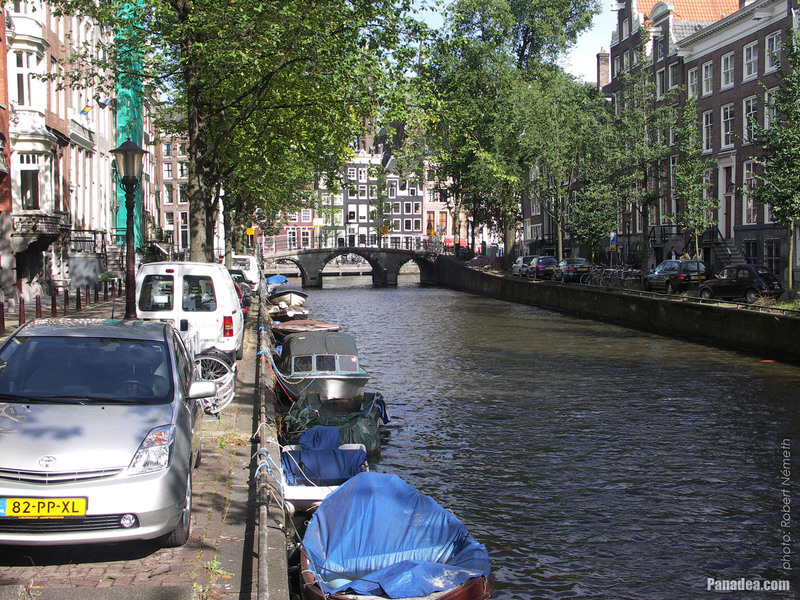 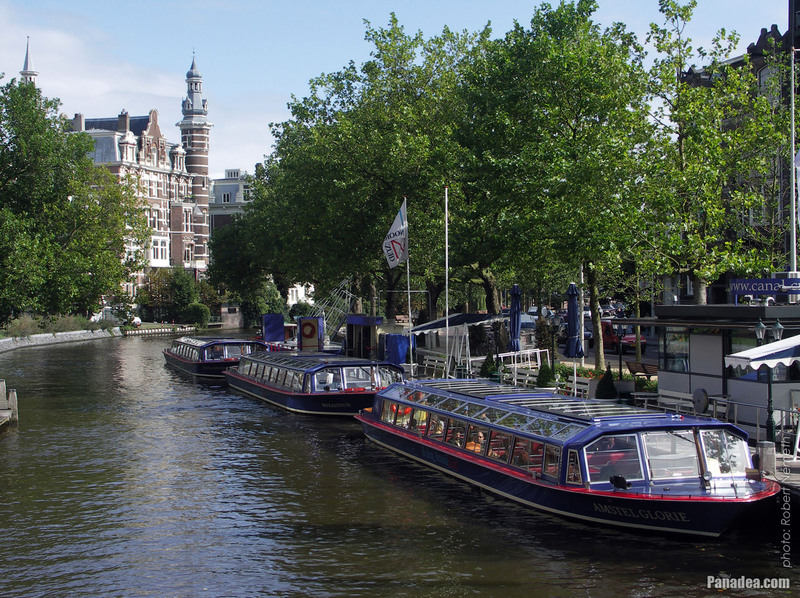 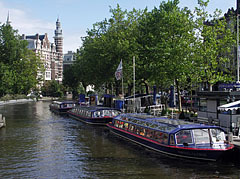 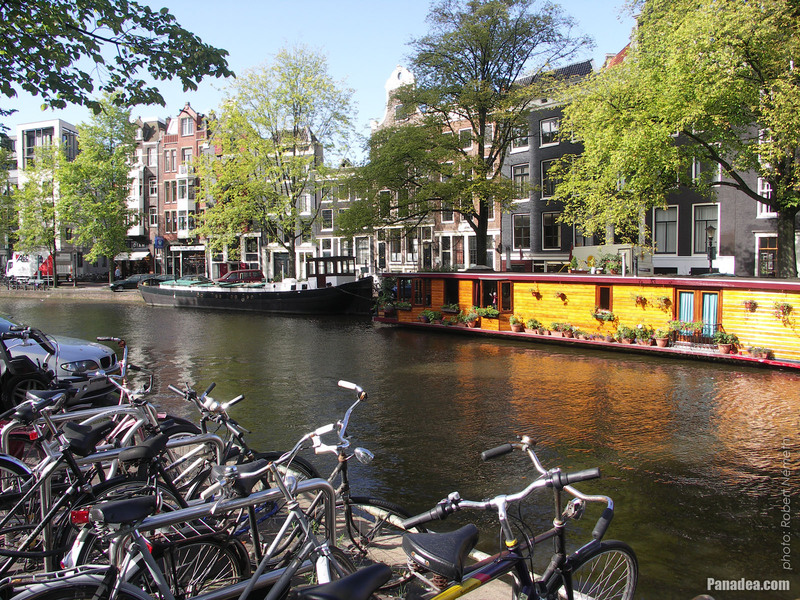 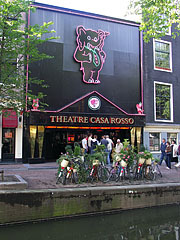 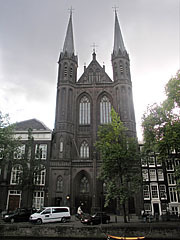 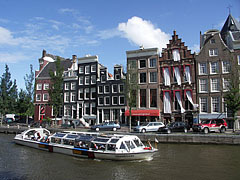 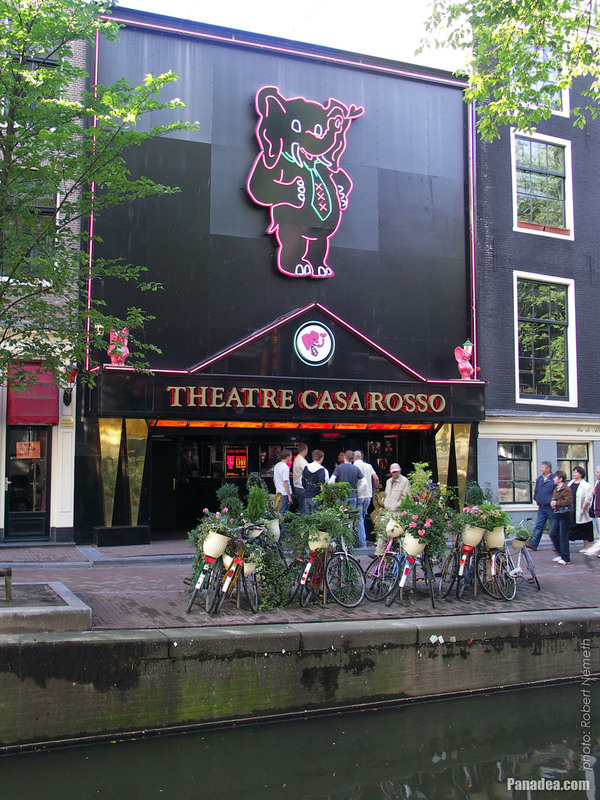 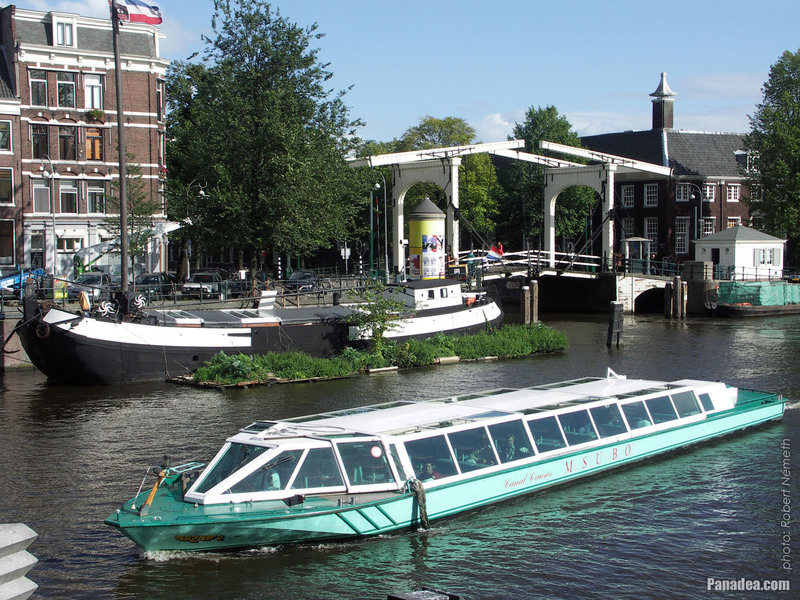 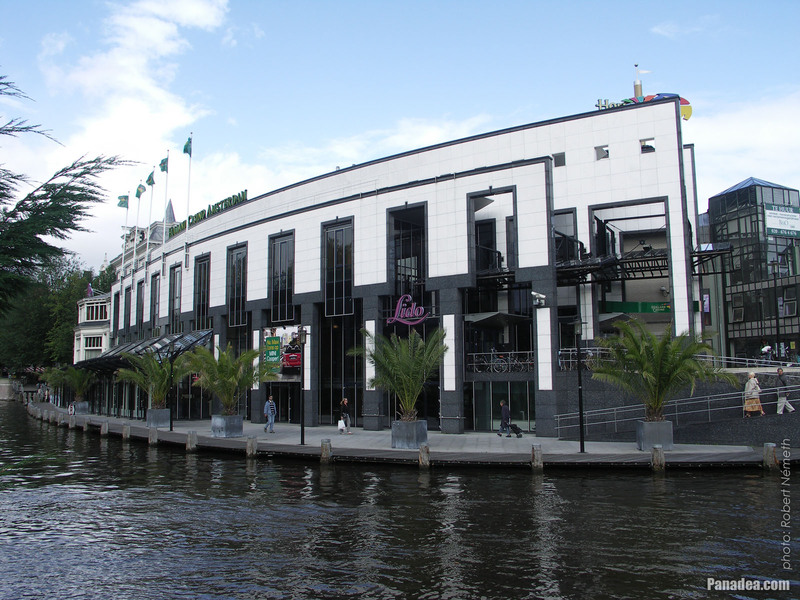 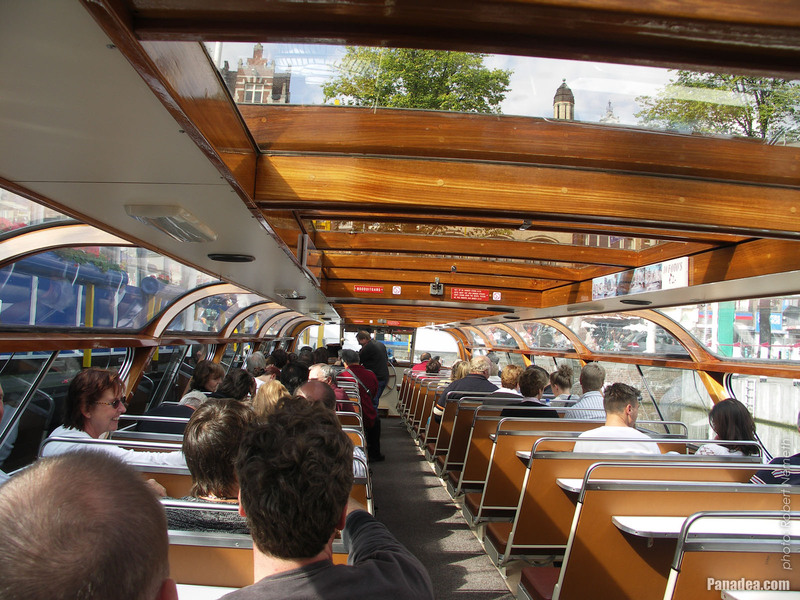 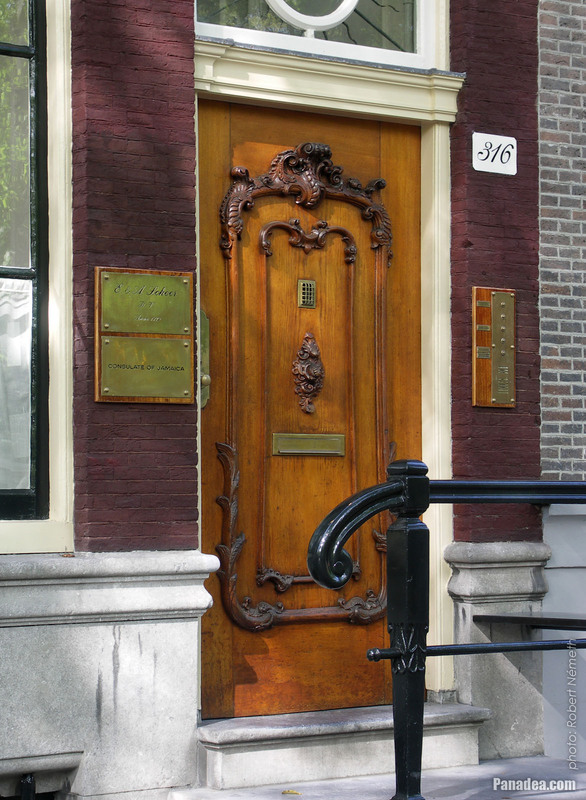 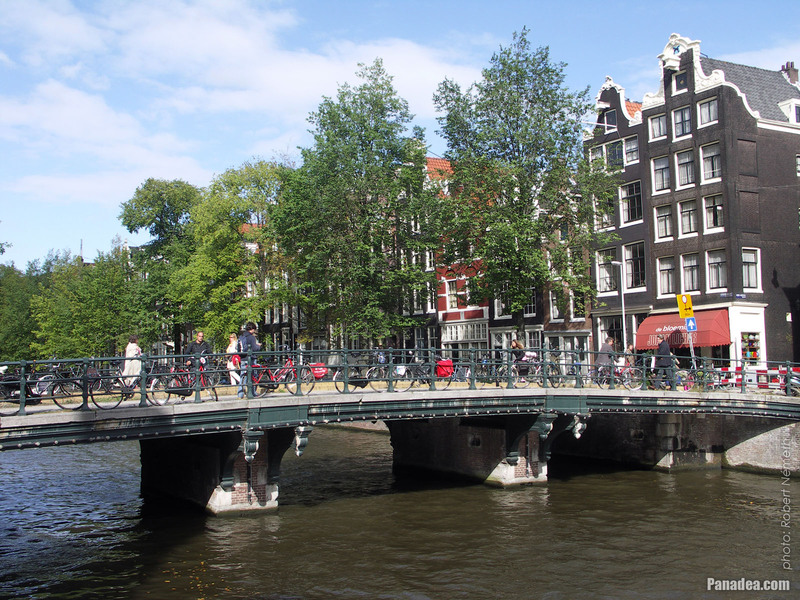 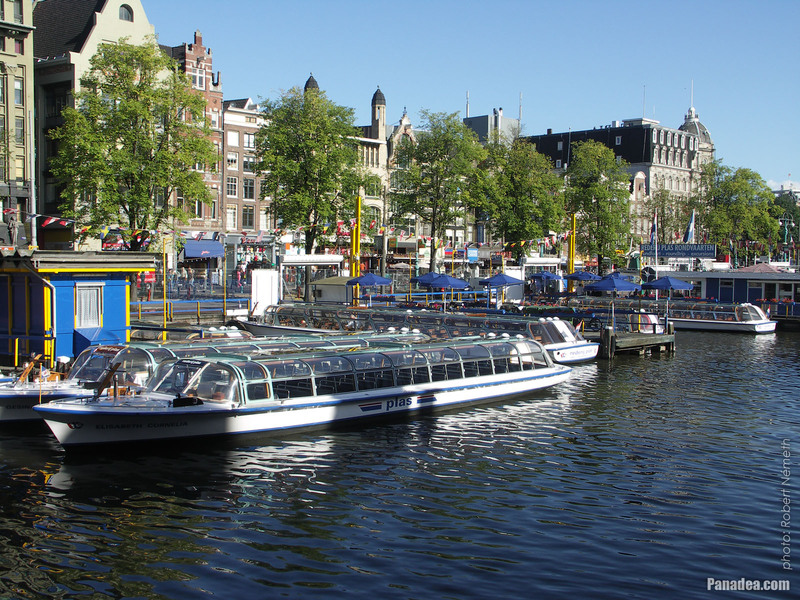 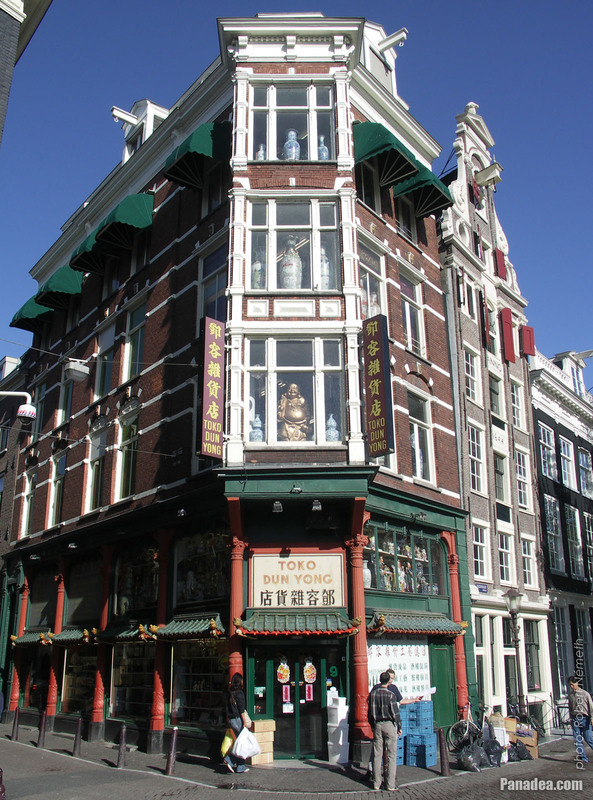 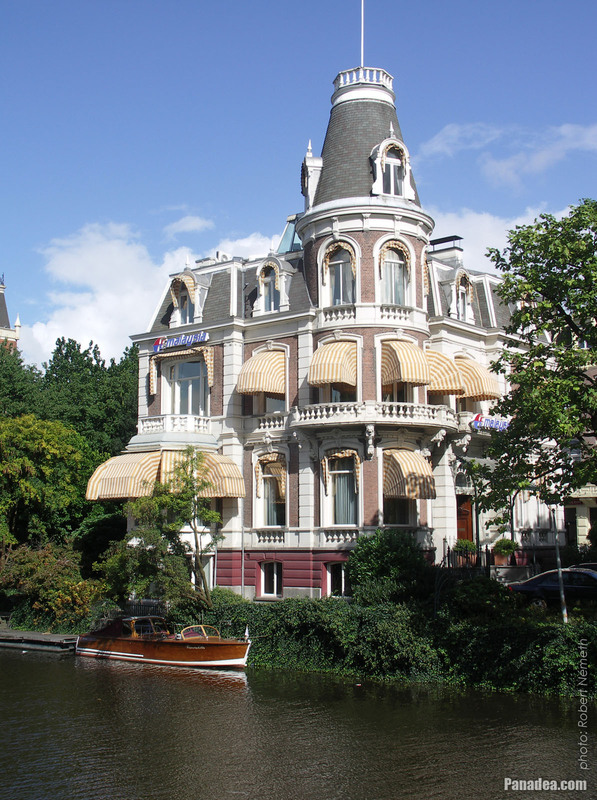 Originally it was built in the 1480s, after burnt down it was rebuilt in 1620 in Amsterdam Renaissance style. 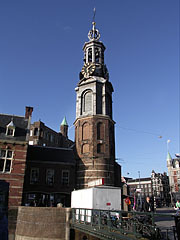 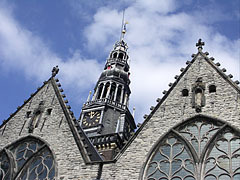 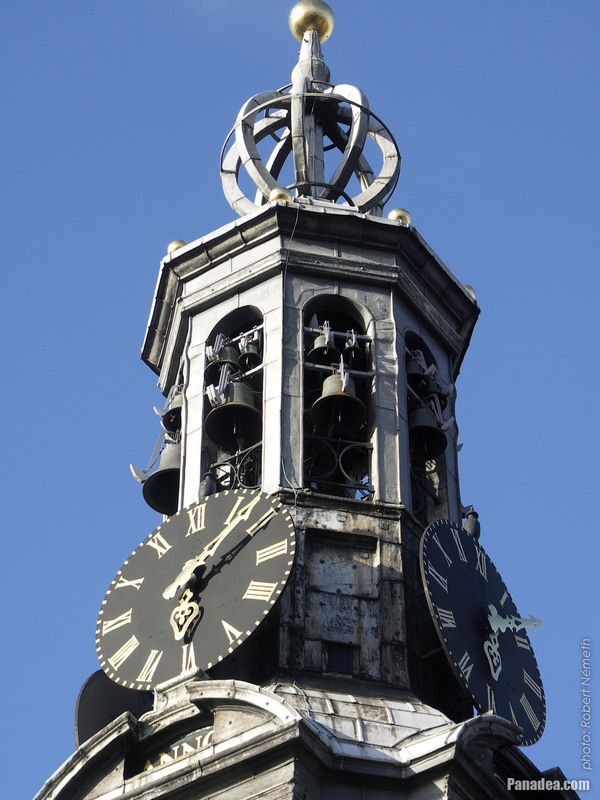 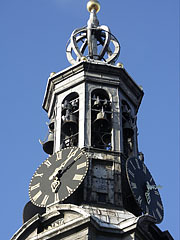 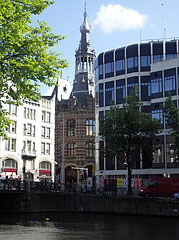 The carillon was made by Pieter Hemony in 1668. 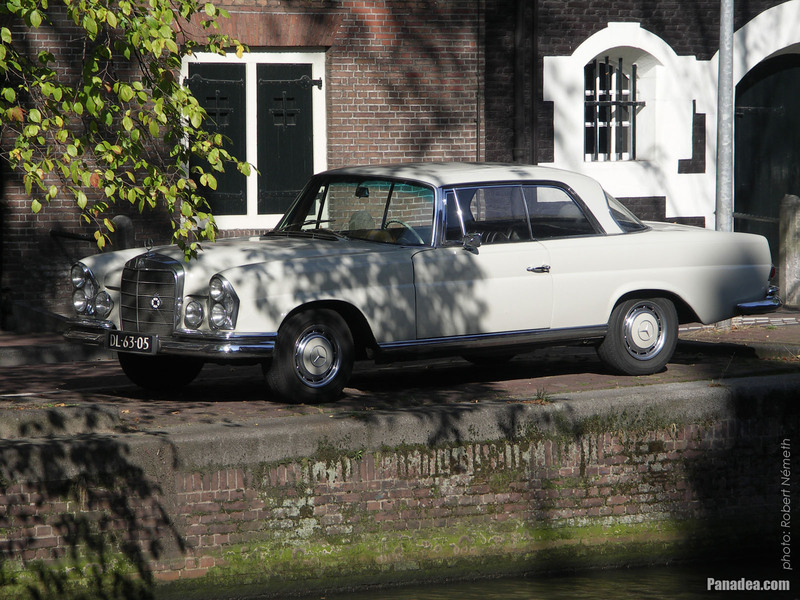 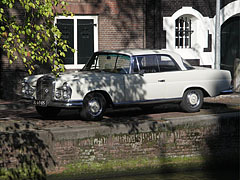 Mercedes-Benz W111, this model was produced between 1961-1971. 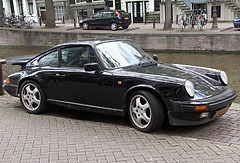 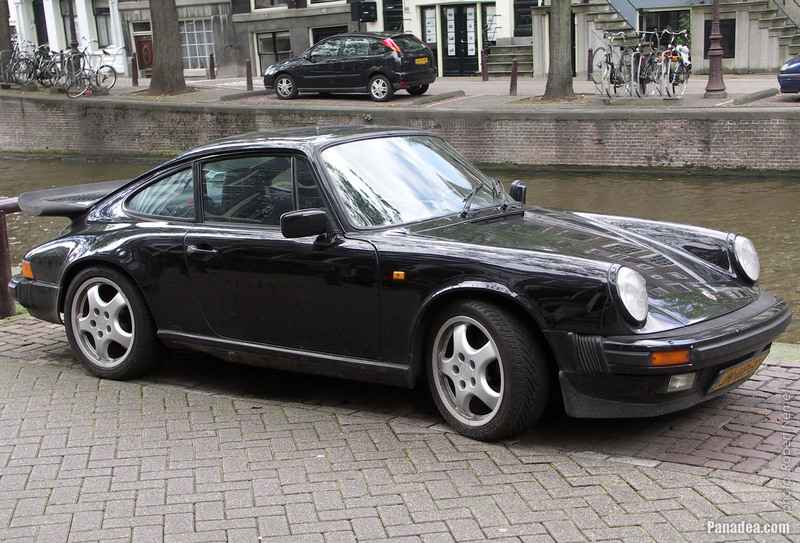 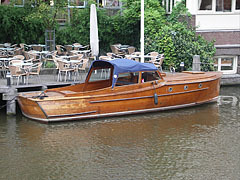 Probably this model was made around 1986. 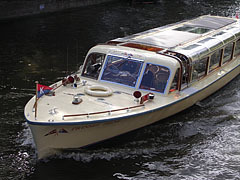 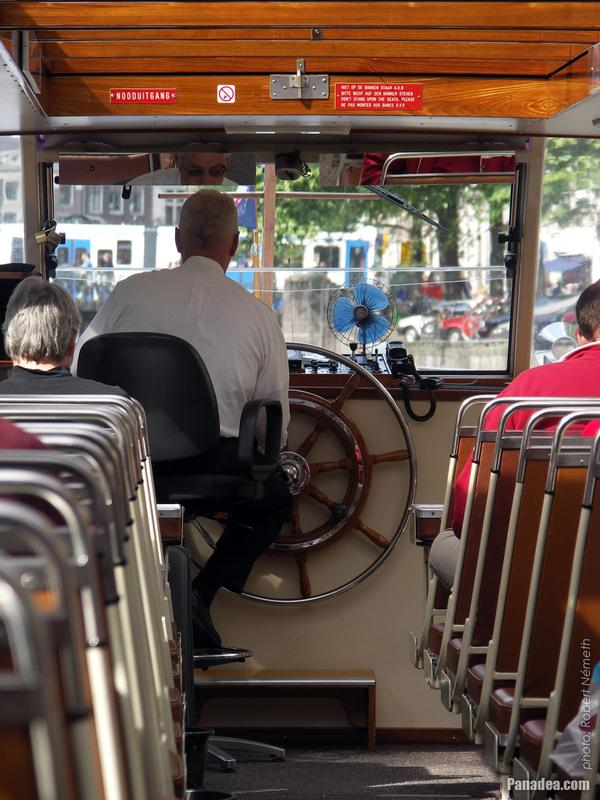 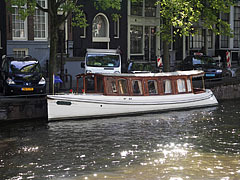 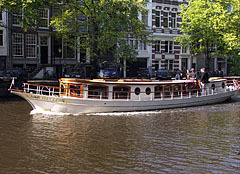 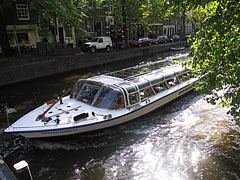 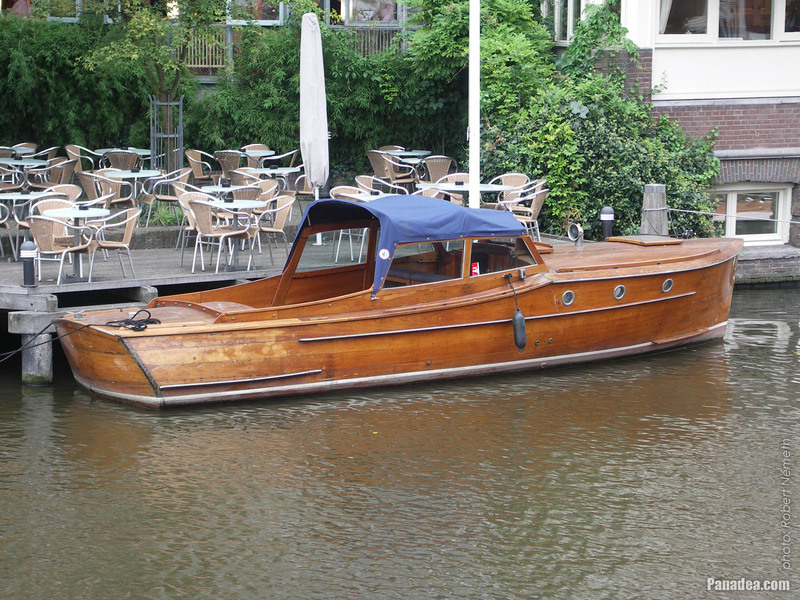 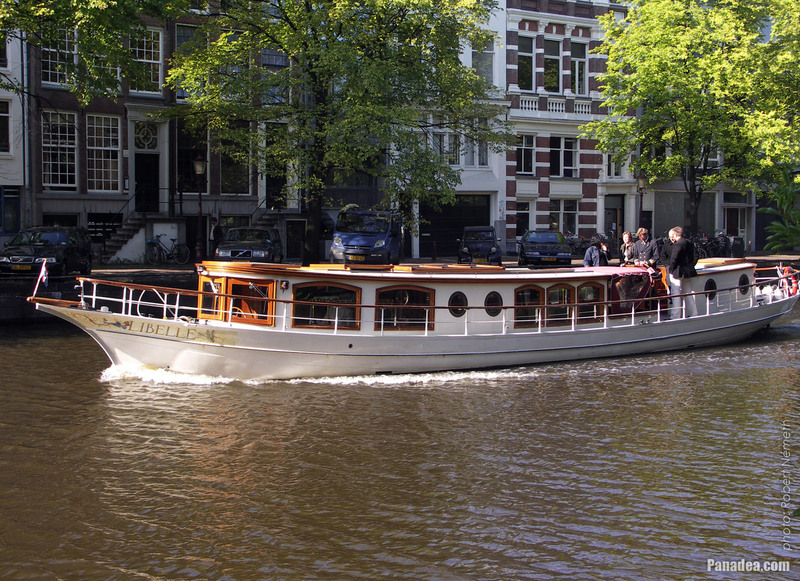 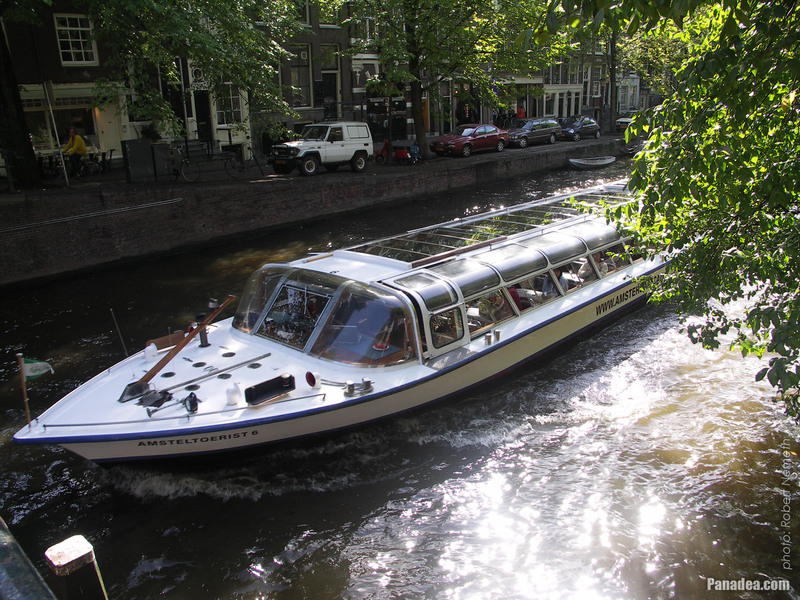 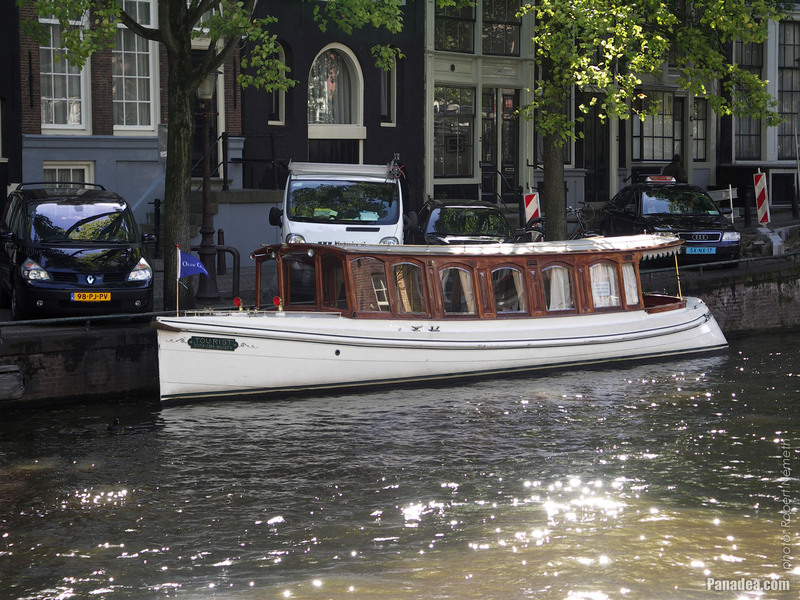 This boat looks a the traditional Dutch wooden shoe (perhaps not by accident). 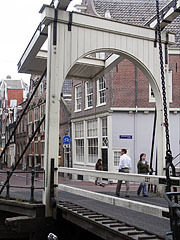 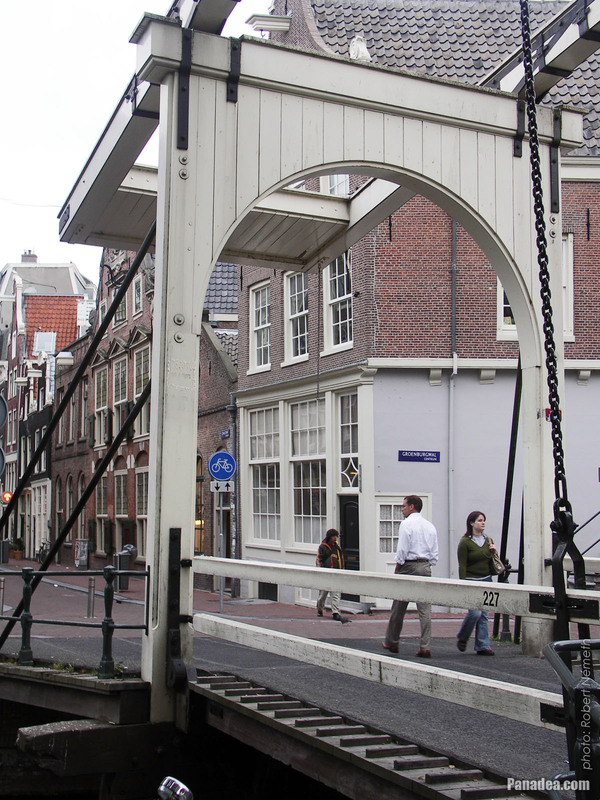 This is one of the 8 wooden drawbridges of the city.